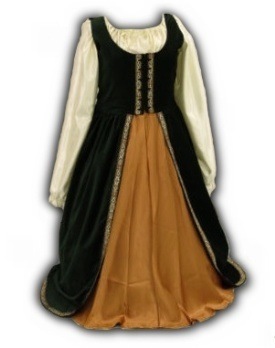 Transform from a peasant into a regal Duchess in this beautiful renaissance gown! Certain to make you the center of attention, our gown is made of 100% cotton velveteen, lined in various, contrasting satins, and trimmed with sumptuous jacquard trim. Boning in the front provides support and a flat surface over which to lace the gown. The front is open down the front of the skirt to show off your colorful, included satin petticoat. Wear this gown with or without our farthingale, and the blouse of your choice (each sold separately). Order the gown by your natural waist size, the narrowest part of your middle section (not the low-waist where modern pants are worn).